On Saturdays we wear pink for the showing of Mean Girls at the park. Cady Heron is a hit with The Plastics, the A-list girl clique at her new school, until she makes the mistake of falling for Aaron Samuels, the ex-boyfriend of alpha Plastic Regina George. 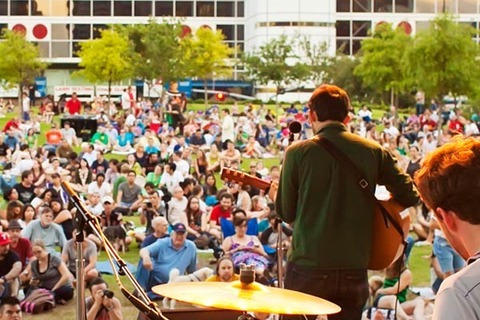 Who’s up for Girl’s Night Out at Discovery Green? Enjoy family-friendly movies with a view of the downtown Houston skyline. Arrive early for contests and activities. Blankets, pets (on leashes), and picnics are welcome and encouraged. Lawn chairs are allowed on the north side of the hill. Food, beer and wine are available for purchase at The Lake House; glass containers or outside alcoholic beverages are not permitted in the park.